This post first appeared on the Salesforce.org blog. Is your organization maximizing its potential through outgoing communications? Are you reaching your constituents with appropriate messages at times when they can have the most impact? If not, then you need a better system to manage your marketing and communication needs! Salesforce Marketing Cloud brings marketing automation to your nonprofit or higher education institution, allowing you to communicate with your constituents through multiple channels, including email, mobile, social media, advertisements, and via the web. It includes various tools that allow you to build cross-channel journeys for your constituents to follow. With Marketing Cloud, you can send an email to a donor, direct them to your social media sites, engage them with social postings and hold their interest as they interact with your organization. Marketing automation is important for any nonprofit organization, as it streamlines your marketing efforts and provides a clear view of your metrics. Want to send an email and follow up with a customized message to people who acted on one of your calls to action? Marketing automation does that for you. If you want to appeal to a broad constituent base, you may find Marketing Cloud to be the perfect tool to compliment your mission. 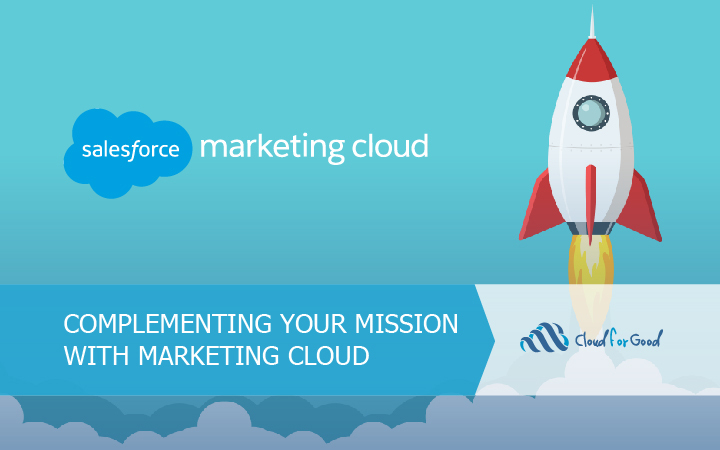 Best of all, nonprofits receive a discount on Marketing Cloud! Let’s jump in and evaluate the different parts of the platform and how you can put them to work in your organization. Journey Builder is one of the coolest parts of the Marketing Cloud. Right now, what happens when someone donates to your organization for the first time? They probably get a thank-you email or letter, and perhaps that donor is added to your newsletter list so they receive future updates. With Journey Builder, you can make these communications much more personal and real-time, designing a series of messages that are responsive to the donor’s interaction with your organization. For example, your new donor gets a welcome email with a link to sign up for your monthly newsletter. If they do not sign up within three days, you can send them a friendly reminder. Once they sign up, you send another message asking which programs interest them. A few days later, they see a promotion on Facebook that includes volunteer opportunities related to those programs. They have been delivered multiple messages through different channels and now are signing up for a volunteer opportunity. Keep them engaged with reminder text notifications about their jobs and shifts. This rich interaction is happening automatically! Once set up, it will continue running for each new donor who gives to your organization. You can now communicate with your constituents in a connected way on the platforms that they want to use. Does your organization provide training programs? If so, the email tool in the Marketing Cloud allows you to design and schedule messages to targeted groups of constituents, either through an automated tool like Journey Builder or Automation Studio, or as a mass email message. Let’s say you provide different programs to help the unemployed learn about job skills. These courses may range from resume writing to interview skills to learning more about Microsoft and Google products. You can store content like images, text blocks, and videos, in your portfolio to be used and/or re-used in different messages. Dynamic Content is another great feature that lets you can send unique and customized email messages, even in a mass email send. If one of your users has completed a resume writing class with your organization and the next step in your programs is an interview course, you can send them information that highlights the next available courses for them to complete. Dynamic Content allows you to populate a content box with different images and text, depending on information you have about the recipient of the message. Course reminders, as well as available courses that meet your predefined criteria, can be automated with Marketing Cloud. Email is just the beginning of what you can do with Marketing Cloud. There are also some great mobile engagement tools. With Geofencing, you can trigger a mobile push message to your constituent’s phone, based on their geographic location. Does your organization host a major event each year or multiple events in different locations? Geofencing will let you trigger a message as they approach to welcome them, let them know where to sign in, and what time your event starts. It’s another way to give your constituents a personal experience with your organization. Social Studio is Marketing Cloud’s social listening and engagement tool. Social Studio includes two tools: Publish, which allows you to schedule and publish content to multiple social media channels; and Engage, which allows you to monitor activity on your social media accounts, as well as in the wider social media universe. Social Studio does everything that its free counterparts (like HootSuite or TweetDeck) can do, but it has functionality that allows you to manage more complex social communication. This tool is a great fit for larger nonprofits that want to manage an integrated, responsive social media presence across multiple schools or departments. If we revisit the event we mentioned in the paragraph above, Social Studio will let you see how event attendees are using social media to communicate with each other and your organization, leading up to the event, the day of the event and in the following days. Marketing Cloud is a robust platform that can be beneficial to all nonprofits. We’ve provided an overview of how our favorite features can be used at nonprofits. In our next post, we’ll dive into how creating donor journeys can help your organization raise more funds.